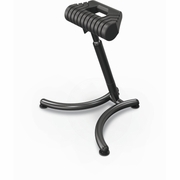 The Innovative Up-Rite Pneumatic Height Adjustable Stools are designed for use with a sit/stand desk or workstation. Get the versatility of standing while relieving the stress associated with being on your feet. Built from rugged materials, stool is designed for long lasting performance in any environment, including industrial, educational, commercial, or medical.